An outdoor kitchen is great for entertaining guests and simply giving you an excuse to enjoy the great outdoors! It is time to get your backyard ready for the warm weather that is approaching. If you are thinking about an upgrade to your yard for the upcoming summer season, an outdoor kitchen is a great idea. It will add a unique element to any of your gatherings and just give you more reason to go outside and enjoy the weather. 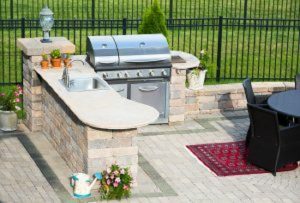 Here are three benefits of an outdoor kitchen for your home. An outdoor kitchen allows you to make your meals outside rather than indoors when the weather is nice. Everyone who cooks knows that it can make your kitchen and home a lot warmer while the stove and oven are on. This makes you want to crank up the air conditioning so that you aren’t overheating while making your meals. An outdoor kitchen eliminates this problem and gives your air conditioning a break. Cooking outside will surely save you some money on those expensive utility bills. Outdoor kitchens are becoming more popular and desired by people looking at homes. Stainless steel is a great material for your outdoor appliances because it is designed to withstand various weather conditions. People love to have a nice yard to go along with their homes and one that has a fully functional outdoor kitchen is even better. If you are ever considering selling your home, an outdoor kitchen has a very high rate of return on the investment you put into it. An outdoor kitchen provides an extra element when it’s time to entertain guests. You no longer have to crowd your kitchen with people when it’s time to eat or order food from a restaurant. Simply fire up your grill and with a few tables and chairs in the yard, you are bringing the restaurant to your backyard! Guests can take a dip in the pool or soak up some sun while they enjoy the smell of freshly grilled food. This also eliminates the hassle of having to clean your entire home for guests because everyone will be outside. Whether you want a unique outdoor kitchen or are ready to invest in a beautifully-installed pool, Paradise Pools can complete the job. We have the expertise to walk you through every step of the process and ensure that you end up with a pool you can’t wait to take a dip in. Ready to get started designing the perfect pool for your home? Trust us with the job and be swimming in no time! For more information, contact us online or give us a call at (301) 725-0005. To get more fun pool design ideas, follow us on Facebook, Twitter, Pinterest, Google+, and Houzz. This entry was posted on Friday, April 6th, 2018 at 4:02 pm. Both comments and pings are currently closed.